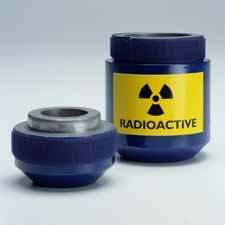 Erm....if the contents of that canister are radioactive, shouldn't it be closed? Of course it should. Radioactive materials are dangerous and should be avoided at all costs. So, that Mickey Mouse watch you have with the glow in the dark hands? Get rid of it. Same with all your glow in the dark toys. They don't actually use radioactive materials in those anymore. Yeah, I said anymore. Older watches used radium to make the hands glow. Also, toothpaste used to have uranium in it. Radioactive hot springs were all the rage for a while for people to go and get healthy! People would stand next to nuclear power plants, hoping to be bitten by a contaminated bug in the hopes of becoming a super hero. But radioactive materials are out there. And they can be dangerous. Or, they can be totally harmless. I have a chunk of Uranium 238 sitting on a shelf in my library. I got it from Amazon. If I decided to eat it, my uranium might make my tummy upset, but it probably wouldn't hurt me too much. But it's a low grade sample, used mostly for testing geiger counters. I bought it because, hey...I have uranium! Other radioactive materials aren't so benign. Some isotopes of uranium are so dangerous that being exposed to a chunk the size of a quarter for 5 minutes will cause sever radiation poisoning, and even burns. But, no matter how dangerous it is, all radioactive material will someday be safe. Because of the nature of decay, dangerous isotopes, like uranium. will decay into less dangerous ones, like lead. It just takes a long time. A really long time. Like, billions of years, long time. Which brings us to todays post. Welcome once again to Made Up Monday! You decide if I lie or if I tell the truth. Sometimes it's easy, sometimes it's not. But it's always fun. For me. Radiation has played a very prominent role in a whole genre of American literature: The Comic Book. Why, there have been scores of heros and villains created just because they had an encounter with some radioactive something-or-other. And it's one of those heros I'm going to talk about today. He is the super hero known for having the worst movie ever made about him. (well, one of the worst movies, at least). The year is 1964, and his name is Matthew Murdock. He is the son of Jack Murdock, a professional fighter who is down on his luck. Matt want's to follow in his fathers footsteps, but his father want's Matt to go to college and live a successful life. But, college is expensive, and the gym Jack runs just doesn't cover the bills. So, Jack signs an agreement to fight for the promoter known as 'The Fixer'. Fixy earned his nickname by, surprise surprise, fixing fights. But, at the same time Jack was signing away his integrity, Matt was walking along the street. OH NO! A large cargo truck is running out of control, and it's going to hit an old man, walking with a cane! True to the comic book code of conduct, Matt jumped in and shoved the old man out of the way, and was himself hit by the truck instead. And, off the truck flew a canister of radioactive waste that stuck Matt in the head, and spilling some of it's contents on him. Matt was rushed to the hospital. Jack was feeling guilty because he blamed himself for Matt getting hurt. (comic book logic....deal with it). Matt wound up blind. But he noticed that all his other senses were somehow stronger. Despite his fathers wishes, Matt trained at the gym to be a boxer. A blind boxer. The Fixer schedules a fight for Jack, but told him to throw the fight. Jack was a man of honor and integrity, so he didn't. He won the fight. And the Fixer had Jack killed. Matt swore vengeance against The Fixer, and all other evil-doers. He became: The Daredevil! That is the actual truth. That's the way Stan Lee wrote Daredevils origin. But this is Made Up Monday. All Made Up Mondays start with the truth. Now it's time for me to tell another part of the story, and for you to tell me if I'm full of it, or if it's true. One thing that wasn't addressed in the origin story for Daredevil was, what happened to that container of radioactive material? Most of us would assume it was retrieved during the accident clean up, right? But we'd all assume wrong. That canister, after hitting Matt, fell into a sewer, where one of the witnesses to the accident later followed it. But when the witness came upon it, he found that it had broken a glass jar a young boy had been carrying. And inside that jar were four baby turtles. They also fell into the sewer, and were crawling around in the radioactive material. The witness fished the turtles out of the slime and carried them back to his lair in the sewer. There he raised them as his own. But he couldn't call them all 'turtle', so he decided to name them. He gave them the names of four renaissance painters; Donatello, Raphael, Leonardo and Michelangelo. The witness? A human from feudal Japan who had been turned into a rat named Splinter. For 20 years, Splinter trained his turtles in the martial arts. And in 1984, the Teenage Mutant Ninja Turtles emerged from the sewers to fight crime, avenge Splinter by defeating Shredder, and eat pizzas. That's right. the same event that created Daredevil also created the Teenage Mutant Ninja Turtles. It's not everyday one event spawns several super heros. So loyal readers, true or not? Did the same radioactive good that gave Daredevil his super powers also create our four favorite turtles? Stay tuned for the answer tomorrow.